In my early Spring post I was wrong about the Dark-eyed Juncos having gone north for the season. 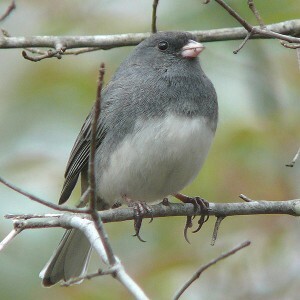 On the 9th of April I saw a small troupe of juncos pecking the stones on our gravel driveway. Obviously, all the juncos hadn’t flown back to Canada quite yet. Robins made their Spring appearance and have been hopping around the place for a few weeks now. 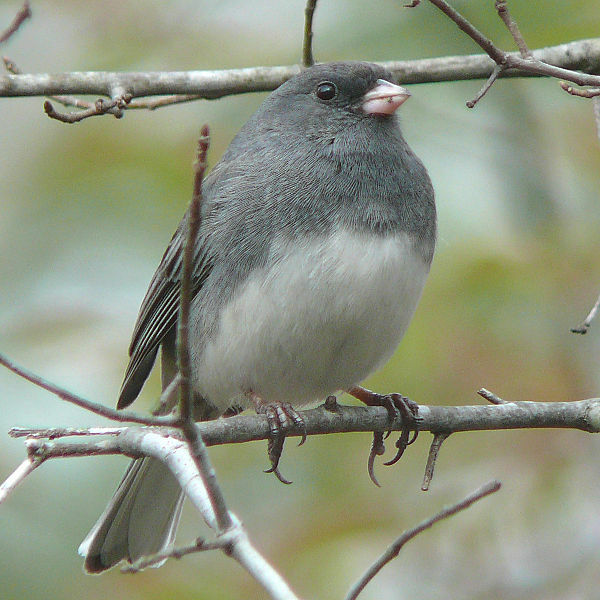 I suppose the juncos will leave any day, unless they are year-round residents that stay in the Appalachian Mountains all year. Dark-eyed junco or slate-colored junco, female. Another blooper popped up last week when listing a few early blooming plants that are ahead of schedule this year. As luck would have it coltsfoot was mentioned as one of the plants that were finished blooming for the season, albeit earlier than normal. Such a definitive statement is bound to get one in trouble with the whims of Mother Nature. In most places along our country roads you can see the seed heads of coltsfoot plants that have already bloomed for the year. The round, composite seed heads are much like the spent flower heads of dandelions that a child picks up to blow the seeds into the air. 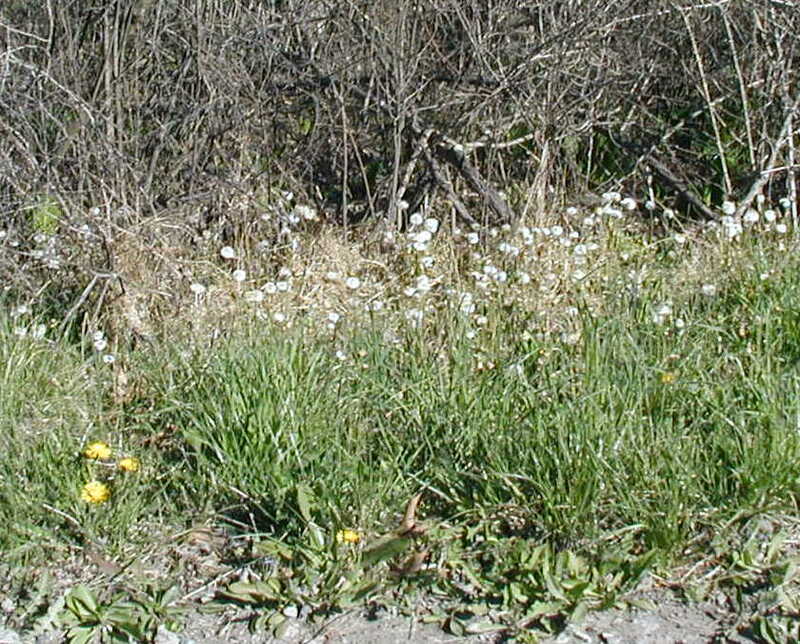 Coltsfoot seed heads are white in the background and dandelion is flowering yellow in the foreground. Photo taken 5 April 2012. The flowers in the photo above faced south with at least a road’s width of open space to its south. 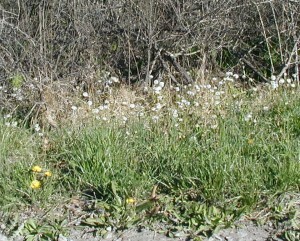 One usually finds this early spring bloomer along roadsides and in full sun. Most of the coltsfoot flowers have ended their early blooming for the year but small pockets of flowering coltsfoot may still be seen. 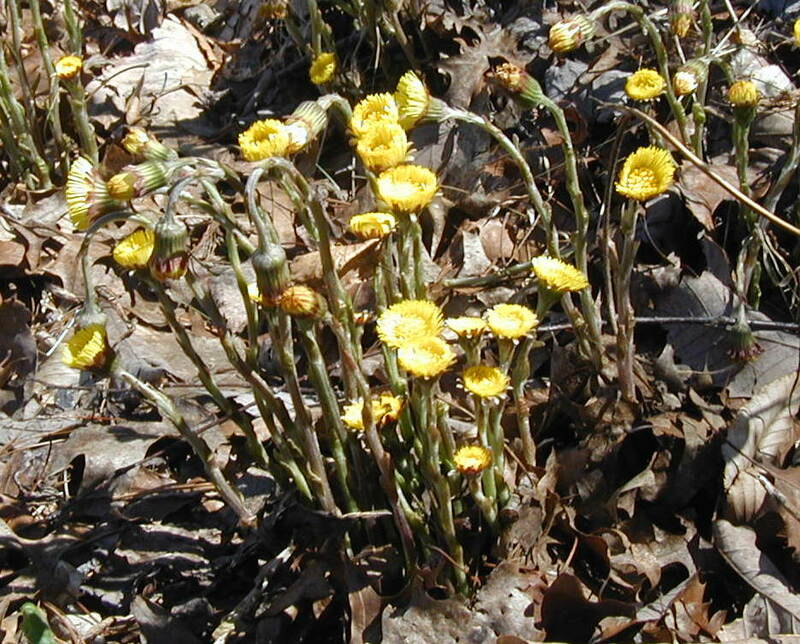 Look in secluded or shady areas for the last-flowering coltsfoot blossoms. 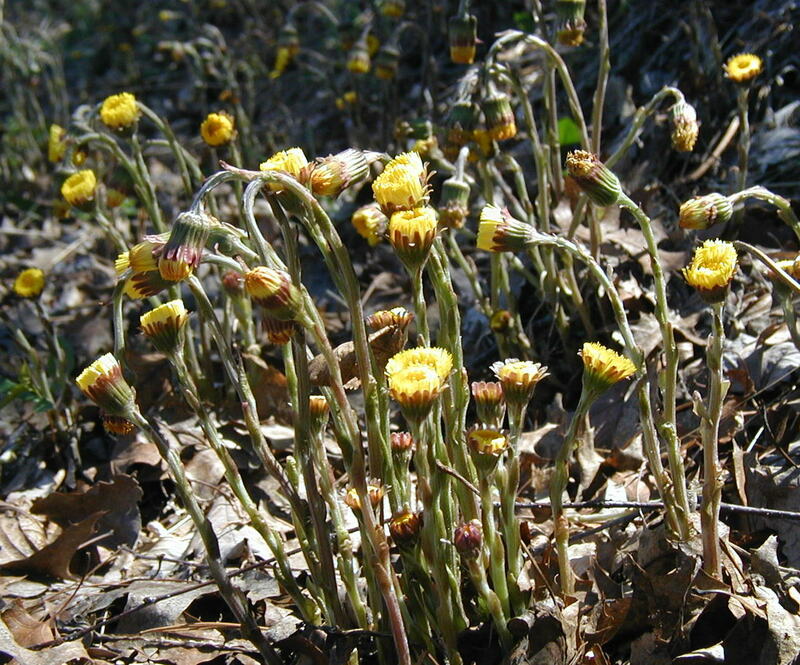 Coltsfoot flowers close up and droop their heads overnight, then raise them in the sunshine of the following day. Photo taken 12:30 p.m. on 5 April 2012. Trading the cold of night for the warmth of sunshine, coltsfoot flowers gain enough energy to raise their heads and open their composite flowers. The coltsfoot in this particular location didn’t seem to open their flowers completely by late afternoon, so they were probably on their last few days before turning to seed. Coltsfoot flower heads open up slowly in filtered sunshine. Photo taken at 2 p.m. 5 April 2012. 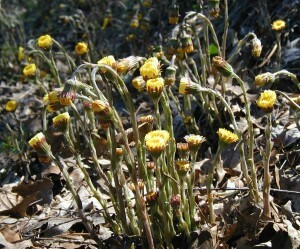 The last two photos are of the same clump of coltsfoot, taken about an hour-and-a-half apart. 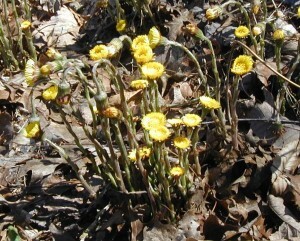 This grouping of coltsfoot was along a Pennsylvania country road and adjacent to woodlands on the south. Sunlight was filtered through the trees and so made for a late-blooming set of coltsfoot. Spring has sprung a little early this year. The calendar says it starts on March 21st but we’re seeing all the signs already. Meteorologically speaking winter is December, January and February, so any time in March we should start seeing Spring happening. 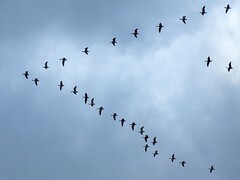 We have been hearing the flocks of Canada geese and swans flying north for a couple of weeks now. Robins have appeared and are singing loudly from the oak treetops. It occurs to me that I haven’t seen juncos for a while now, so maybe they’ve flown back to Canada, too. 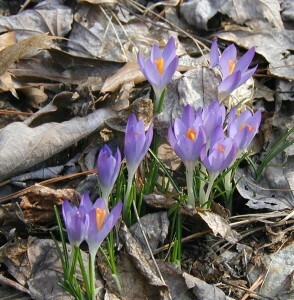 The crocuses started poking their heads out of the ground and yesterday was the first day to see them blooming. A different type of bulb, anemones, bloomed last week. We call them “early crocuses”. 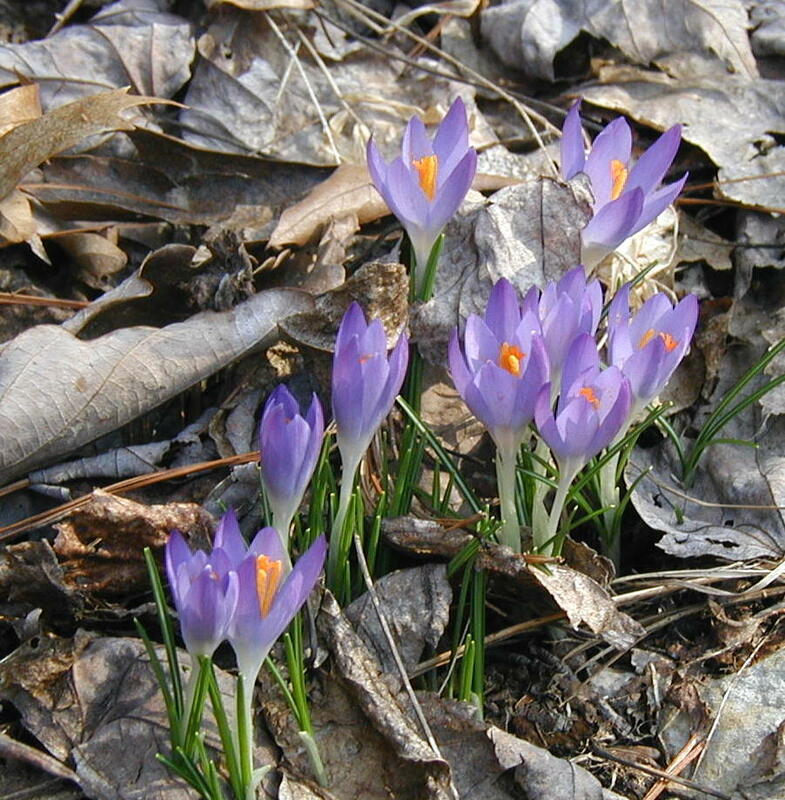 Early crocuses or anemones in bloom. Photo taken March 6, 2012. 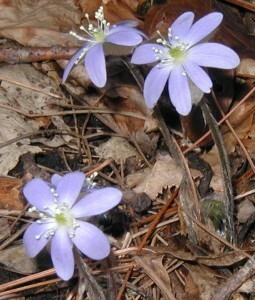 The anemones have thinner petals whereas the later crocuses have wider petals that are rounded at the tips. The linear leaves are very similar with the white midrib, but the anemone leaves are also thinner. 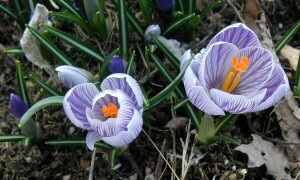 Crocuses showing off their wide petals in bright white and purple. Photo taken March 13, 2012. The temperatures here in the eastern US are about 20 degrees warmer than usual, so many trees have popped their leaf buds. Maple trees, elderberry canes, wild roses and blackberries have all pushed out their leaves. The elderberry leaves have grown the most so far, but with warm weather predicted for the next ten days or so, we expect the pollen levels to shoot up from lots of tree activity. 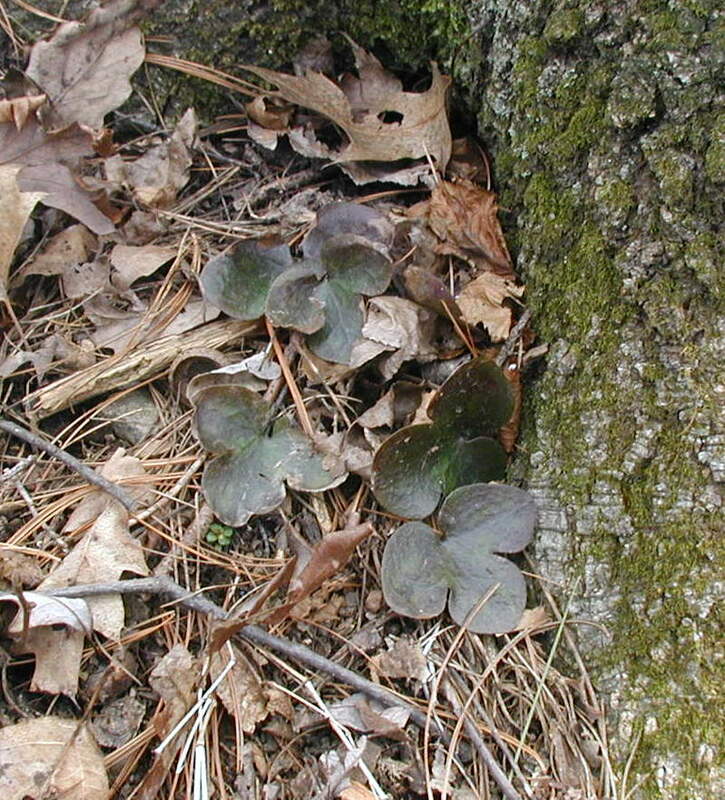 In the woods hepatica isn’t blooming yet. I did see one flower bud at the soil surface when I checked them yesterday, so I suspect that hepatica may bloom early this Spring. Hepatica not quite blooming yet this year. The maroon-tinted leaves remain from last year. Photo taken March 12, 2012. 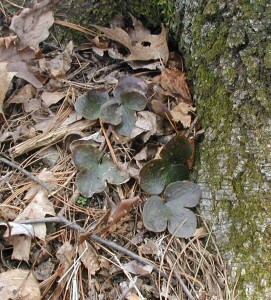 Hepatica americana is a favorite of mine and since it’s growing wild on our property, you know I’ll be checking these plants often until they bloom. April weather can be very exciting. On the first of April it snowed on our mountain ridge, to be followed in two weeks time by record high temperatures! Sometimes the plants don’t know what to do and put off growing or blooming until the conditions are better. My photos from last Spring show that we’re about a week to 10 days behind last year’s blooming times. 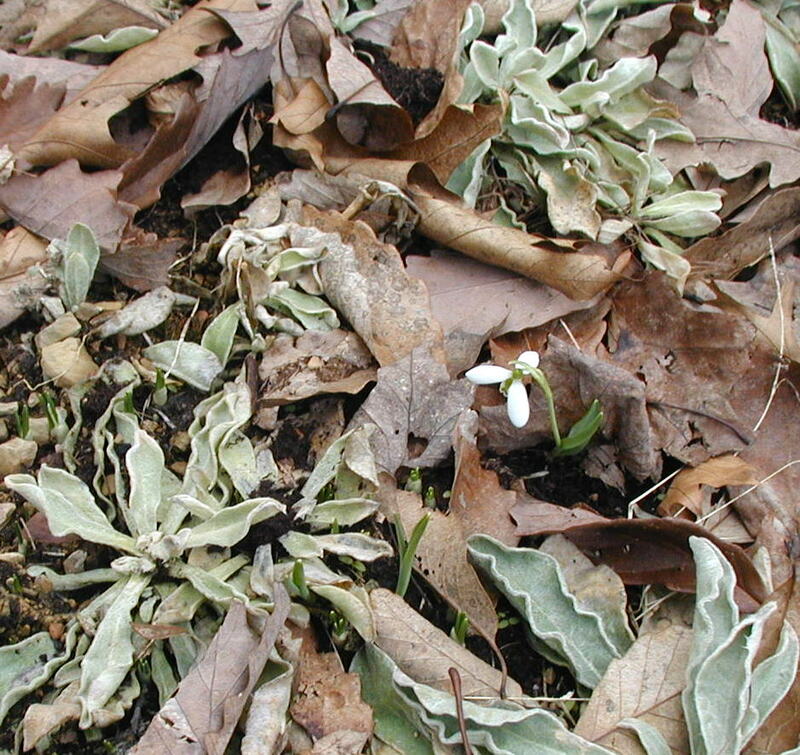 Those that flower first in April are likely to be dusted with snow or harmed by a frost. Spring bulbs don’t seem to mind though. 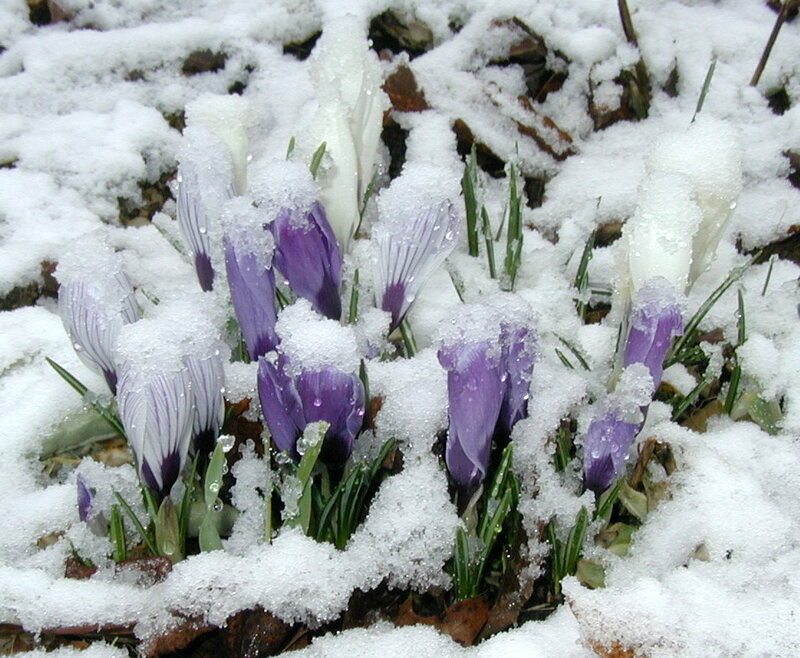 Crocus flowers covered by snow in April. Cold hardy crocuses can take the cold and the snow. These flowers were in bloom another week after this photo was snapped. Photo taken 1 April 2011. In the woods I think the hepatica has been waiting for a little sun to open its flowers. The past week was rather cloudy and wet, until Thursday when the temperature rose up to record highs in central Pennsylvania. Harrisburg hit 84 degrees. People were outside everywhere! Hepatica blossoms blooming in the sunshine. The nice weather has really brought in the feeling of Spring, where you want to be outside and feel the breeze on your face and the warm sun on your skin. Enjoy it and look around – you never know what you’ll find! The warm winds that have blown our way for the last few days have been awakening. Geese flocked by overhead, bird activity in general is picking up, and chipmunks have been seen. I’m not sure if the juncos have flown away yet, but the red-winged blackbirds are back. Record high temperatures were tied in several local areas yesterday. It was in the mid-70s, well above normal. Now, it’s one day away from the calendar start of Spring and flowers have started blooming. Although wildeherb concentrates on the wild herbs or plants that you might find blooming on a hike in the woods or other natural area, sometimes garden variety plants are included. It’s only natural to relate what we find out in nature to what’s going on in the flower beds or vegetable garden. Our first-blooming plant was a bulb, the snowdrop. The first snowdrop was spotted blooming on March 12th and it has bloomed for a week now. These are hearty little flowers that you can sometimes see blooming in the snow. Once their blossoms are seen, the thawing of Spring can be felt. 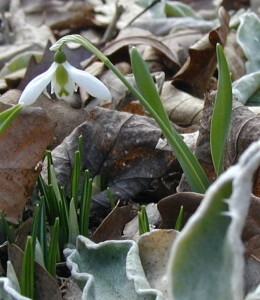 Snowdrop blooming among the heritage flower rosettes. Photo taken 19Mar2011. The snowdrop bulbs were planted in a bed where the heritage flower grows. You can see the crumpled-looking, velvety leaves of the first year rosettes that have overwintered. They will sprout long stalks with beautiful magneta flowers in May-June. Snowdrop flowers dangle. Photo taken 19Mar2011. The snowdrop flower opens up its three petals on sunny days. On cloudy days the petals remain dangling. 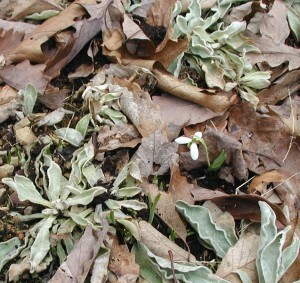 The linear leaves are broad compared to the shorter, variegated ones of the crocus bulbs that are just starting to develop blossoms underneath the snow drop flower above. Pennsylvania bittercress was first spotted blooming yesterday, 18Mar2011. Its miniscule flowers are quite low to the ground. 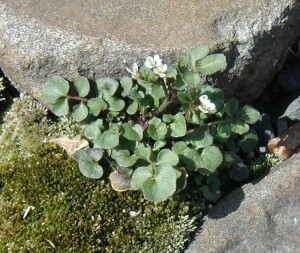 PA Bittercress blooming between the flagstones along a walkway. Photo taken 19Mar2011. In our little micro-climate the first blooming garden plant is the snowdrop and the first natural plant to bloom is the Pennsylvania bittercress. With respect to first-blooming times, the plant pictured here most likely had an advantage living among the warm flagstones and sand. No bittercress plants were found blooming in the yard away from the heat of the rocks next to the house. Red-flowering maple trees are one of the signs of spring that I look forward to seeing each year. 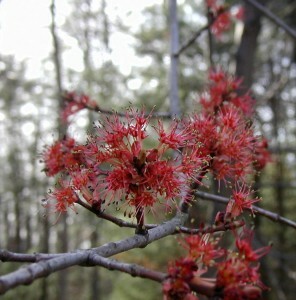 The maple flowers give a red tint to the hills around us in the mountain ridges. We have a kind of love-hate relationship. Love their pretty look and signaling of warmer weather to come, hate their pollen. It’s probably a source of dripping noses and itchy eyes for many of us. Tree pollen is very high at the moment. Looking at the woods we still see deeper into the woods than we’ll be able to in a couple weeks. Without the leaves full out on the trees we can see farther among the trees. Right now our house seems like we have a lot of room around us — it sits in a clearing of the forest. When the trees are leafed in, it will feel a little closed in at first. Kinda claustrophobic until we get used to the new look. Then, when winter comes again we’ll feel a little bare. Barren trees belie their current state of activity. The sap is flowing and they are getting ready to burst forth with greenery. 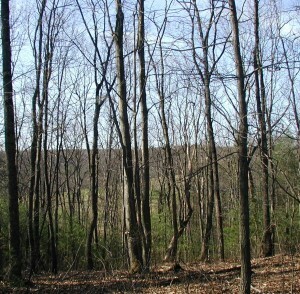 Barren trees on a ridge top in the mountains of Pennsylvania. Note that you can see through the trees all the way over to the next hill. 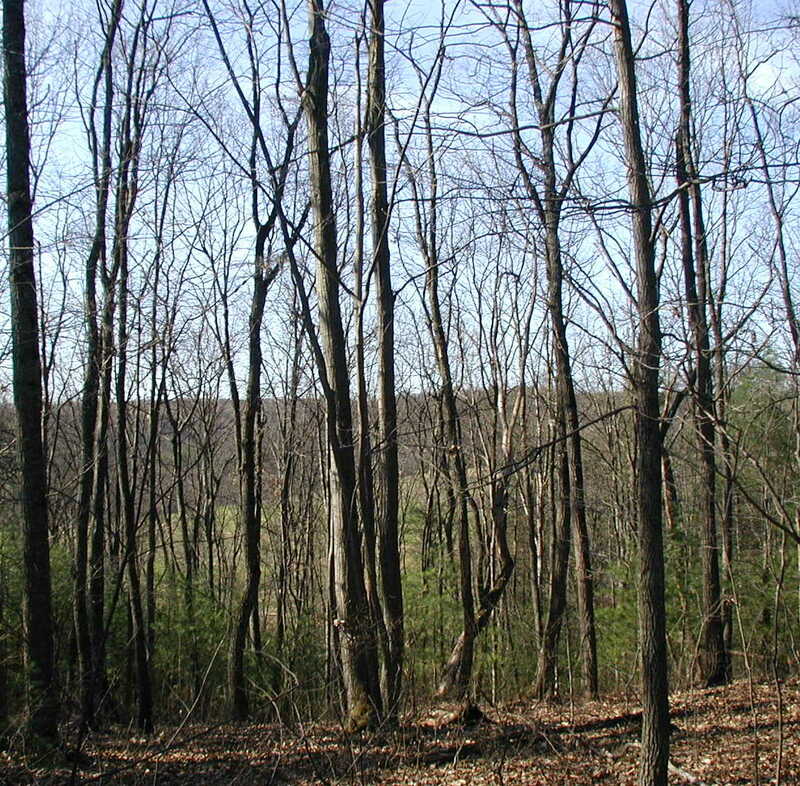 Green showing in the lower part of the picture is from the white pines. 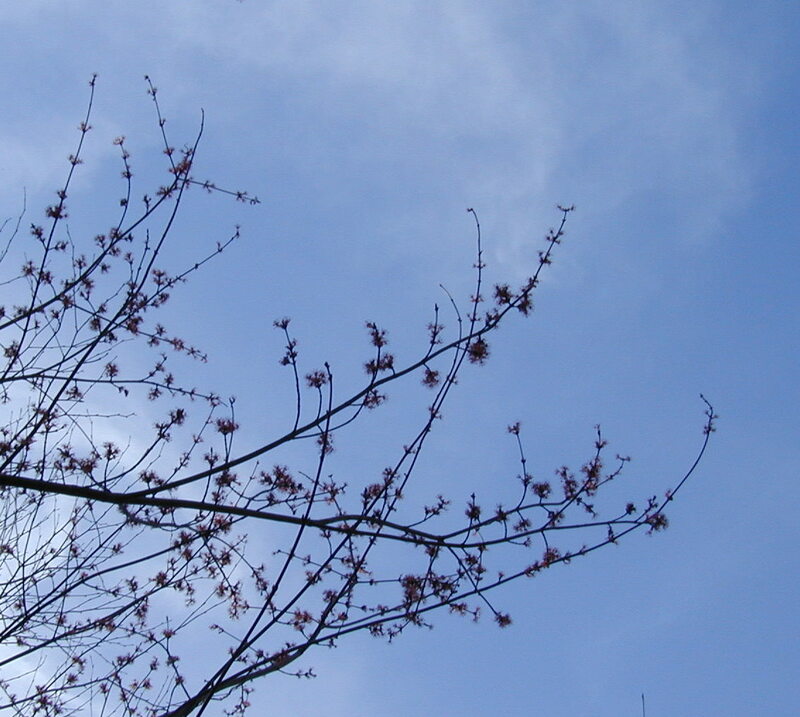 Most trees are bare of leaves, but the maples are sprouting their red flowers. Flowering maple tree against the pale blue March sky. Take a closer look at the flower. It has many long stamens that gives the maple blossom a bushy or fluffy appearance. I just love the deep red color, though! Red flowers of the maple tree. One neat thing is that the flowers appear before the leaves do. I guess that happens with quite a few trees, but the maples are the first to sprout some color.